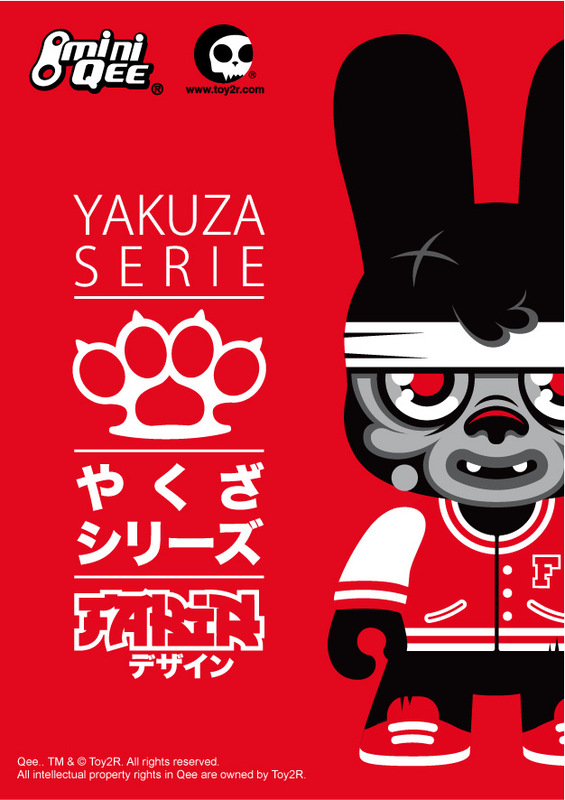 June 2012 - Announcing the latest addition to the 5" Mini Qee Artist Line - The Yakuza Series by Fakir. Toy2R USA makes every effort to scour the globe to find new artists and fresh designs to work with and when we found a set of original custom Mini Qees by French artist, Fakir, it was a no-brainer that they should be made into production pieces. 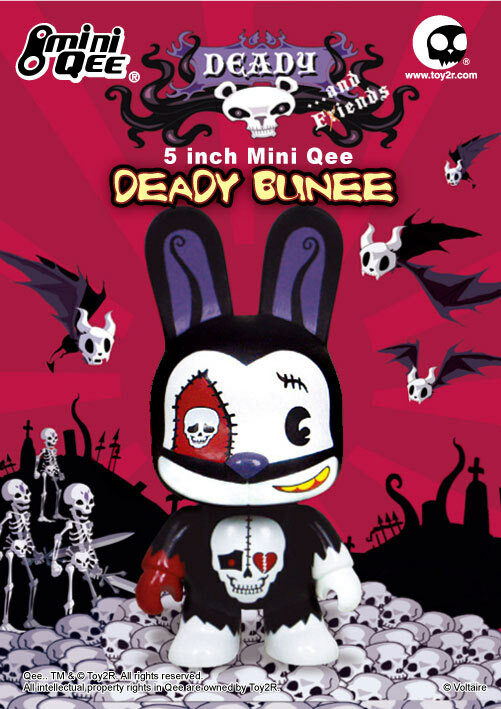 Originally the artist created a similar design using the 9 inch Bunee Qee, but creating a collection using the Mini Qee platform seemed the best way to explore the variations of Fakir's Yakuza theme. Scheduled to be released in August with an SRP of $28.00 each, expect to see a few different versions as the Yakuza take over the world. ABOUT THE ARTIST: Young Parisian artist, Fakir became known designer toy lovers with its customs figurines perfectly executed. He is also behind the Rabbit Qbiq he himself has self-produced. Easter is just around the corner and it's going to be a veritable Buneepocolypse in 2012! Even Deady, that evil teddy bear of Voltaire's, will have to disguise himself as a bunee to prepare for the impending assault. 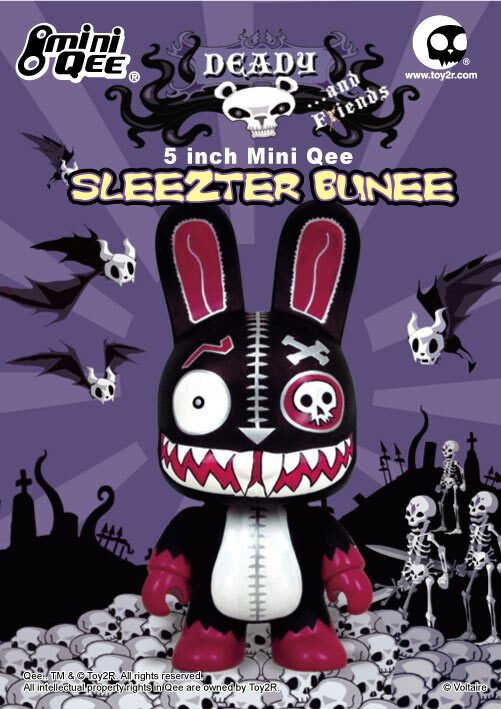 Deady's comic book nemesis, Sleezter Bunny is also coming and he's bringing evil legions of Death Bunnies with him to take over the world. Prepare yourself for the next onslaught of Deady Mania to sweep the globe as April marks the release for, not one, but two Voltaire 5 inch Mini Qee Bunees! With the Deady 'Big in Japan' and Urkor Mini Qees now sold out, no one should miss this chance to pick up the next figures in the ever evolving world of Deady. Check with your favorite shops and reserve yours today.